Where to relax and refresh before the big day. From that surprise RSVP to making your zillionth decision, wedding prep can be almost as exhausting as it is romantic. Enter the spa day. Whether your party can fit in a full day or even just one hour, these havens of calm and beauty will leave you glowing from the inside out. Close your eyes, breathe deep, and let the love flow. 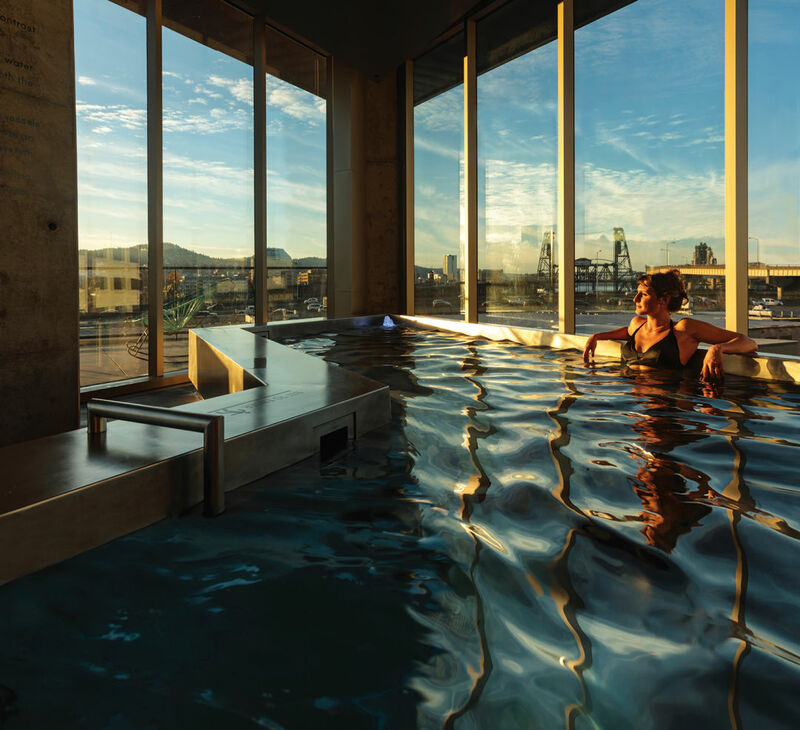 Hovering five floors above the city on the Central Eastside, Knot Springs’ “wellness-centered social club” offers visitors panoramic city views with a side of relaxation to members and non-members alike. Enjoy a dip in one (or all) of their three warm, warmer, and cool pools, or rinse your worries away under the exfoliation shower. End your visit with a stop on their terrace, rest- ed and relaxed, soaking up the view peacefully above the fray. Nestled in the heart of Willamette Valley wine country, out-of-town visitors will especially enjoy a trip to this spa. Offerings like the spa’s own signature “Pinotherapy” products or hydrotherapy treatments like the “Oregon Rain Shower”—a head-to-toe rain therapy massage experienced under a waterfall—celebrate and cultivate visitors’ sense of place. Inspired by the sauna culture of Scandinavia, these two day spas offer the kind of straightforward approach to relaxation that even the most spa-averse people (yes, those exist) will find appealing. At just $26 for a two-hour sauna visit, Loyly is the perfect wellness escape for those who want to plan a day that is easily within reach for all. With two locations on the outskirts of Seattle proper, these Korean day spas have garnered a cult following for their winning combination of affordability and luxury—perfect for brides who want to treat their wedding party to a rejuvenating day of salt rooms, steam saunas, hydrotherapy, and infrared energy rooms without breaking the bank. Sometimes you need to actually get away from it all in order to truly relax. Hit the road and head to the Spa at the Salish Lodge. Just 30 minutes outside of town—but worlds away from the stresses of the city—this spa is quintessential Pacific Northwest luxury. Relax with a soothing lavender-scented massage surrounded by the beauty of Snoqualmie Falls. Or, get a jump start on your wedding day glow with one of their signature dry-brushing treatments, featuring an invig- orating full-body exfoliation followed by the application of all-natural oils to moisturize and revital-ize from head to toe. Get gorgeous from your brows to your toes at this urban oasis inside the historic Fairmont hotel. Choose from three bridal packages—including one that features a year of spa membership, 20 visits to the infrared jade pod, and free bubbly with every treatment— or cherry-pick from their lengthy spa menu.